Remember the mid- to late-1990s? When everyone and their mother came up with a .com and an idea of delivering the wackiest products or services through the magic of the Internet and the funding of bottomless venture capitalists? For example, you know, lobsters. Lobsters. By Internet. Delivered by FedEx. Makes perfect sense. Started in 1995 by Providence, Rhode Island entrepreneur Andrew Rock, Lobster.com has been delivering fresh lobsters — only the freshest and Maine Certified — for more than a decade. Being early adopters, means that they got a fantastic URL and they recently put that to good use with an identity redesign by fellow Providence business, Nail. 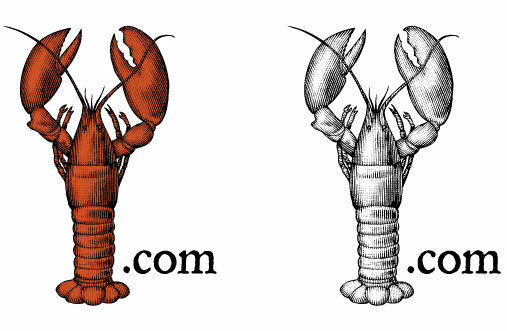 In a bold move, the logo doesn’t spell out the word “Lobster,” and instead it simply shows you one, an immediately identifiable lobster that works as a very charming rebus and turns a URL that could look like one of those generic catch-all web sites full of ads into a kind of leader URL. Nail hired illustrator Steven Noble to create the custom woodcut illustration of a Maine lobster and then added a slightly distressed, serif “.com” creating an amusing fusion of vintage illustration and contemporary technology. I don’t normally think of the Internet as a place where I would get my lobsters, not that I buy lobster ever, but now I know where to get some shipped right to my house after I’m done posting to Brand New.